Southeast Asia is a colourful region — blessed with dense rainforest, gorgeous beaches, incredible wildlife and people that share diverged traditions and cultures. It also has some remarkable urban centres – stimulated by immense economic growth, derived from trade and tourism. According to a report by Martin Property Institute, the urban population in Southeast Asia "may grow by another 100 million people, rising from 280 million people today to 373 million people in 2030." Though there are various human activities that can cause climate changes, urbanisation is the foremost driving factor in this era of modernisation, digitalisation and fast-paced culture. Ensuing government’s efforts in poverty eradication to fulfil their growing needs, a lot of sub-urbanites and rural-ites are moving to the urban territories in search of employment, educational and economic opportunities, or forced movement to flee political or religious conflict crisis. For example, we have a lot of inter-ASEAN migrants from Myanmar, Indonesia and Philippines migrating to developed nations like Singapore and Malaysia in search for better opportunities. "Southeast Asia is going through rapid urbanisation today. Overpopulation in the rural areas has caused the migrants to be “pushed” from the rural to urban areas (push factor). Attractiveness of urban areas for jobs and economic opportunities continue to be an important pull factor. Urban area offer opportunities for socio-economic mobility to move up the prosperity ladder. Cities have always been engines for economic growth," wrote Senior Fellow of ISEAS Yusof Ishak Institute, Lee Poh Onn, in an email reply to The ASEAN Post. How urbanisation leads to climate change? The rural-to-urban migration often results in overcrowding, pollution and poor sanitation – which is damaging to the environment. The act of pulling people out of poverty and into more developed nations, unfortunately, often comes at the cost of the local environment. It leads to potential environmental consequences if not guided by smart and sustainable policies. If planned poorly, massive urban sprawling can bring about more deforestation, habitat destruction and greenhouse gas (GHG) or carbon emissions. Urbanites also tend to have higher levels of consumption of food and energy than those living in rural areas, which would naturally put more strain on the usage of natural resources – which would eventually cease to exist in supply as it is a diminishing resource. "Urban growth feeds increased commercialisation and industrialisation which will increase the use of fossil fuels. An increase in the use of fossil fuels will add to global warming and contribute to climate change," said Lee. In ASEAN, much of its rainforests are destroyed to create more land area to house the growing population in urban cities. The rainforest, being one the most biologically diverse ecosystems – when destroyed can accelerate climate changes. With rampant deforestation, we reduce the number of trees. With less trees, we have decreased oxygen supply, decreased rain and increased carbon dioxide in the air. These factors will lead to higher humidity in the region. As one leads to the other, this can increase global warming. According to the ASEAN Biodiversity Outlook report (by ASEAN Centre for Biodiversity, Philippines), the biological diversity in the Philippines, Indonesia and Malaysia will be greatly eroded by 2100 if the destruction of the environment persists – where “the region is poised to lose 70–90% of habitats and 13–42% of species in another 83 years”. The region is also reaching its peak water – the point where we start consuming clean water faster than it can be replenished. For example, the Mekong river which passes through Myanmar, Lao, Thailand, Cambodia and Vietnam is already heavily inhibited – causing the water resources to go scarce. Though ASEAN has readily available natural source of water, much of it is polluted or inadequately sanitised. With concerns for water scarcity, we also face food security as agriculture will equally be affected. Water is the primary catalyst for healthy and abundant crops, besides other factors like sunshine, soil and fertilisers. 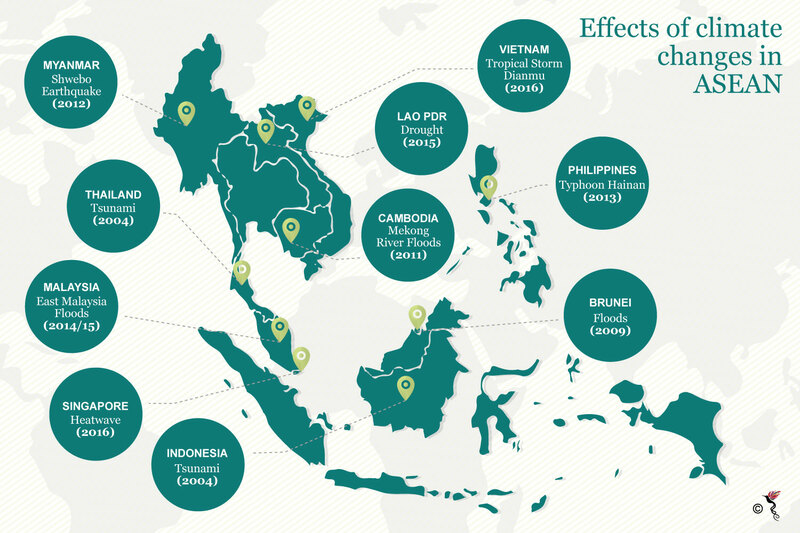 Examples of natural mishaps across ASEAN nations, derived from climate changes. Deforestation, pollution and resource degradation are increasing ASEAN’s vulnerability to natural and human-induced disasters, derived from climate changes. In view of this matter, ASEAN needs to find solutions to adapt to climate change in building a resilient ASEAN. What is ASEAN’s stand in addressing effects of climate change? ASEAN through its socio-cultural community initiatives aims to be “a resilient community with enhanced capacity and capability to adapt and respond to social and economic vulnerabilities, disasters, climate change as well as emerging threats and challenges” by year 2025. Following the growing concern for climate change effects, the ASEAN and European Union (EU) reiterated their commitment to cooperate in addressing the shared challenge of dealing with climate changes in their respective economic communities at the 50th ASEAN Foreign Ministers' Meeting early August. The reiteration also marked the welcoming of the United Nations Framework Convention on Climate Change (UNFCCC) work and the 2016 Paris Agreement. The Paris Agreement is a global deal aimed at limiting the negative impact of climate change – which will include reducing GHG emission. As part of their efforts in battling against climate changes, the partnership will look into “eradicating poverty in order to keep a global average temperature rise to below 2°C above pre-industrial levels and limit the temperature increase to 1.5°C above pre-industrial levels”. ASEAN has thought it all out on paper through its aims and strategies, but how well is all these being implemented or even monitored to our best interest? Effects of climate changes are omnipresent in the region – highlighting its presence even more in the past decade. Although many environmental agreements have been reached, environmental issues continue to threaten to human security because we evidently lack of proper implementation. Without a monitored implementation, we will be in the dark as to where we stand in terms of sustainability, or what works and doesn’t work in conserving the assets of ASEAN. Entailed from ongoing environmental damage, the impact of regional security in ASEAN is concerning. While Southeast Asian nations encourage political actions in favour of economic growth, they struggle to promote sustainable development approaches. Governments claim to work on a balanced approach that compromises both sectors. However, the painful reality of the situation reveals that governments tend to act in inconsistent manners in their conceptions of sustainable economies. Accoding to Lee, the effects of climate change caused by urbanisation can be addressed by "promoting the use of green technologies, improving efficiency in using fossil fuels, reducing traffic congestion and encouraging the use of public transport by improving road and public infrastructure. GHG emissions are likely to be 60 percent higher in Southeast Asia in 2050 compared to 2010." The biggest asset ASEAN has is its lush greeneries and wealth of its natural resources. All these goodness that ASEAN has to offer to the rest of the world must not be annihilated by climate change effects – caused by human-induced disasters in name of urbanisation and development. Human and nature must co-exist. One without the other is meaningless. There’s no two ways about it. ASEAN must intensify their efforts in preserving its nature, investing especially in environmental sustainability to ensure that its’ states continue to be an attractive destination for trade and tourism activities. To sustain ASEAN’s economic progress over the next 50 years, its leaders must commit to focusing on climate change. The absence of a proper nature protection and the effects of climate changes can be detrimental to the livelihood of mankind in this region.